The size- 8 inches in diameter weighing nearly 2 pounds. Seeing hail that size falling would make me feel like I was seeing the end of the world. Saw these magnets while out shopping. 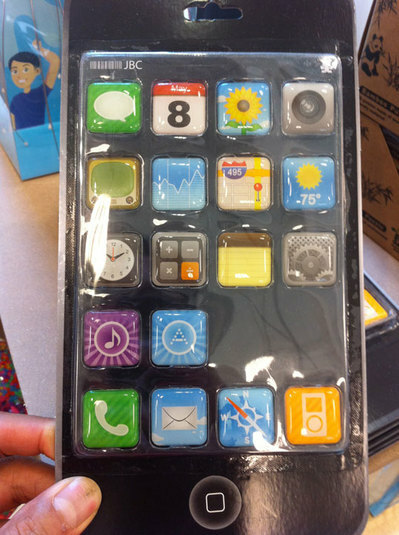 Looks like icons from the iPhone, right? If you look closely at the icons and compare them to the ones on the iPhone, they’ve all been changed to avoid copyright issues. Still looks pretty good! It’s kind of hard to believe but it’s back to school time at the stores. 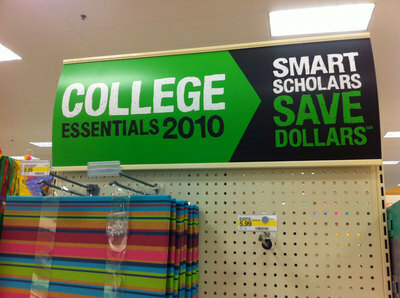 Target is helping out with their “College Essentials 2010”. Let’s see what Target thinks is essential this year. Garbage cans, memo note holders, pen cups, desktop Buddha. 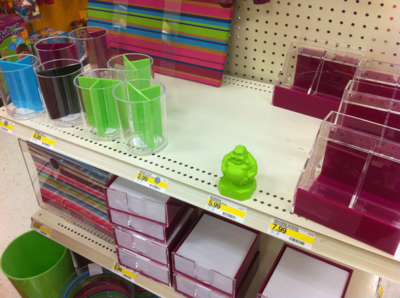 It’s been a while since I was in college, but a Hulk colored Buddha is a college essential? Maybe if you’re Buddhist. 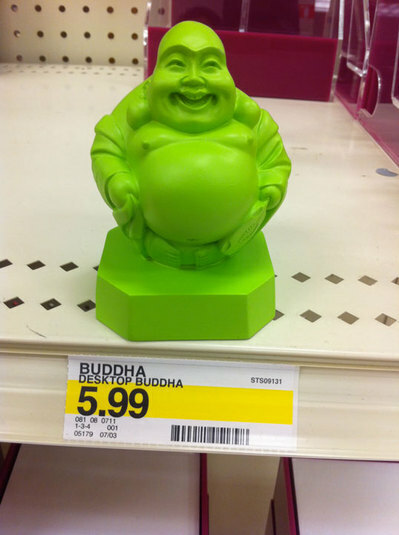 But, if you’re Buddhist, I’m doubting that you’re buying this cartoonish looking Buddha from Target. I must have missed the bright orange desktop Christ. A Japanese village creates art using rice paddies as their canvas. Amazing. It’s going to be hotter than heck tomorrow, but if you’re looking for something outdoors to do, try blueberry picking at Rouster’s Apple House in Milford. We went several weekends ago and had a fun time picking over 25 pounds of blueberries. We ate a lot of them fresh and then froze the rest for smoothies and pancakes for the rest of the year. It’s a fun family thing with lots of kids around. These days with most of us living in the city, it’s nice to see where your food comes from. At $2.50/lb you don’t really save money, but you do have the satisfaction of finding blueberries that are sweeter and larger than what you find at the store. Check Rouster’s schedule for blueberry picking dates and times. The Seattle City Council has voted to effectively ban the cadaver exhibit “Bodies … The Exhibition” from returning to the city. The ordinance that now goes to Mayor Mike McGinn would bar commercial displays of human remains that don’t have proof of consent. When Bodies the Exhibition was in Cincinnati I protested it primarily because the bodies were Chinese individuals that were displayed without any consent. It has been show that these bodies are often purchased on the black market. Boycott Bodies the Exhibition Page. Not superior to the iPhone or Android? This is a case of doing your best isn’t quite good enough. Clever Breast Feeding Ad- NSFW? This is a clever breast feeding ad from the Brazil Ministry of Health. I wonder if the FCC would allow a television ad like this to run here in the U.S. For those who don’t get this, look closely at the picture. I came to my office/warehouse today and found that my air conditioner compressor had been stolen. Just ripped off its pedestal. 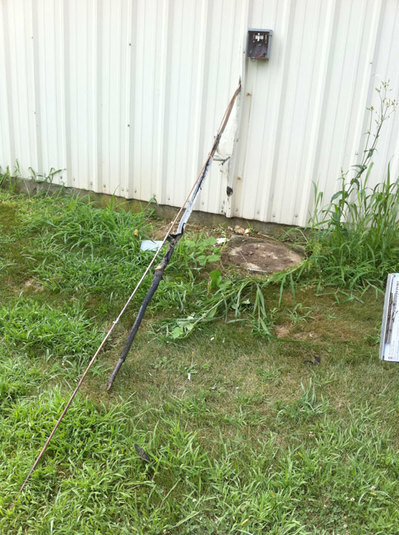 Thieves are stealing anything that has metal to strip and resell. Unfortunately, for the $100 dollars of metal that the thieves got, the replacement costs for me are going to be over $1000. After I get it replaced, I think I’ll be putting a metal cage over it to protect it.